Every visitor to Italy should experience home cooking with a cesarina. Luisa Mambelli, an empty-nester with two adult children, greets us at her mother’s apartment in the Murri section of Bologna. The quiet, middle-class residential area is a short taxi ride from the historic center of the city. A large piece of plywood has been placed atop the mahogany dining table that is centered beneath an elegant chandelier of Murano glass. Because kitchen space is tight, this will be our work station. Two colorful aprons and booklets of printed recipes are set on one side of the oblong table. My husband and I are here for a cooking lesson followed by lunch, one of many authentic food experiences taking place throughout the year in private homes across Italy, from Milan in the north to Catania in the south. Mambelli is one of some 400 home cooks who participate in a nonprofit network called Home Food. Women (and some men) selected for the program are called Le Cesarine, the name derived from that of the Roman emperor Julius Caesar because they are the “empresses” who preside over their kitchens. Being a Cesarine isn’t a regular job. Instead, these are unpaid volunteers who open their homes to guests. They are carefully screened and selected for their knowledge of local foods and cooking techniques, commitment to tradition, and ability to communicate this passion to visitors from other parts of Italy and around the globe. It was founded in 2004 by professor Egeria Di Nallo, a sociologist at the University of Bologna, in collaboration with the Association for the Guardianship and Protection of the Traditional Culinary-Gastronomic Heritage of Italy. The organization has hosted more than 300,000 visitors since its inception. “Almost every dish in Italy has local roots and is best eaten it its place of origin,” Fred Plotkin writes in his book Italy for the Gourmet Traveller. Consistent with that premise, the mission of Home Food is to preserve the local character of Italian food and to honor the traditions of generations of mothers, grandmothers and aunts represented by the Cesarine. Since 1861, Italy has been unified as one nation, but its cuisine and culture still remain regional and local at their core. Although “Italian food” is one of the most popular cuisines throughout the world, the generic term obscures the diversity of its products and preparations. Travelers to Italy soon discover that the 20 administrative regions (in a country about the size of Texas) vary widely in terms of their history, geography, customs and terroir (characteristics of the soil and air). Depending on the city or town someone visits, even the very same pasta dish, for example, may be prepared in different ways and have different names. Home Food hopes to forestall the looming threat of Italy succumbing to one homogenized national cuisine, a trend propelled over decades by a confluence of economic and social forces. With more women in the workforce, many no longer have time or interest to prepare dishes from scratch, relying instead on prepared or preserved products like dried pasta and bottled sauces. Improved transportation and refrigeration systems and the growth of the global economy also have posed challenges to the time-honored customs of cooking seasonal foods grown or produced close to home. Like most of the Cesarine, Mambelli speaks minimal English, but her welcome is so warm it feels as if we are visiting an old friend. Our lunch menu includes two pasta dishes that most typify the Emilia Romagna region: tagliatelle with a classic ragu sauce (made with braised meat, celery, carrots, onions, fresh tomatoes and white wine) and tortelloni stuffed with ricotta and Parmesan cheeses, and spinach. Tagliatelle are long, ribbon-shaped pieces of pasta about a quarter of an inch wide. According to legend, the width corresponds to 1/12,270 the height of the Torre degli Asinelli, the taller of two medieval towers in Bologna, and is modeled after the hair of an Italian noblewoman. The pasta with these precise measurements is reproduced in solid gold at the city’s Chamber of Commerce, along with its recipe. 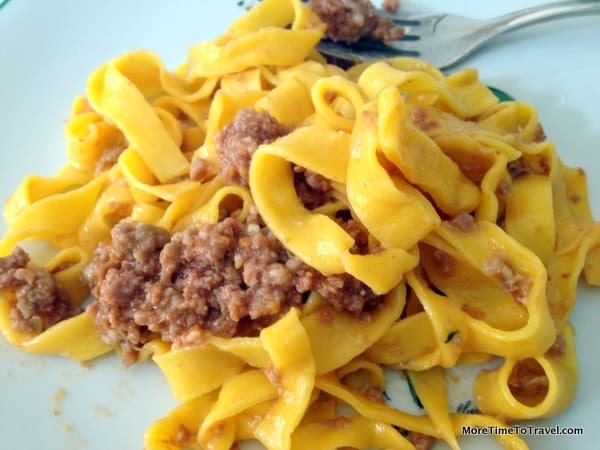 The texture of tagliatelle is considered a perfect conveyance for heavy Ragu Bolognese (Bolognese sauce). Tortelloni probably are the most emblematic pasta of Bologna, having been eaten there since the first half of the 19th century. Considered a main course, the doughnut shape of the stuffed pasta is said to have been inspired by Venus’ navel. Their more diminutive cousins of the same shape, tortellini, are commonly served in broth (tortellini en brodo) with heartier meat fillings. Our dessert will be a moist tenerina cake, whose recipe hails from the nearby city of Ferrara. The soft cake, with a fudge-like consistency, is made with dark chocolate, butter, sugar, flour, eggs, vanilla and milk. After we wash our hands and don aprons, Mambelli transitions into full teaching mode at her side of the table. She gives us our tools and all the ingredients she’s carefully measured beforehand. We make the relatively simple cake first because it needs to bake in the oven. Then she shows us each painstaking step in making sfoglia, the characteristic egg pasta dough. When her 84-year-old mother, Maria Teresa, joins us, Mambelli explains that she learned how to cook by watching her. As we begin working, the need for a common language dissipates. We pay close attention to Mambelli as she shows us how to knead, stretch and cut the dough so it has the right amount of air and proper thickness. It isn’t as easy as she makes it seem. Our dough alternately gets too thin or too lumpy. “No, Jerry!” she shrieks, pulling my husband’s sheet of dough to her side of the table for an emergency repair. Our shoulder muscles ache from using the rolling pins; it feels as if we have spent the last two hours mixing heavy cement. We muddle along and finally achieve a rhythm. Our efforts are rewarded with beautiful strands of tagliatelle, all the same width, and tortelloni pressed so tightly that their filling couldn’t possibly ooze out while cooking. “Bravo! Bravo!” Mambelli says. Maria Theresa smiles simultaneously. By the time we have washed up again for lunch, Mambelli has assembled the dishes in the kitchen and set the dining room table with fine china and glasses of a bubbly Lambrusco wine. Because it takes many hours to make ragu, she has prepared the sauce before our arrival. She proudly serves us each course. Without question, this is the most exceptional of many wonderful meals we’ve enjoyed in Bologna. Not only is the meal perfetto, but our experience in the home of a local is a reminder of the integral link between food and culture. You can register to become a member and make reservations for Home Food lunches, dinners, cooking lessons, wine tours and other events online at Home Food. The website includes a calendar of available dates, locations and menus as well as free recipes. Dinner or lunch is 50 euros per person, including a first, second and dessert course with wine and coffee. Children are welcome. Home Food sounds like a great organization — and the practice parallels with recent travel trends like immersion, slow travel, and sharing with locals. I like it! So glad you shared this with us, including Jerry’s scolding! Thanks so much for letting me know! I’ve corrected the link. Great post and wonderful experience.I was not aware of this Home Food network and you certainly made me want to try it also on our next trip to Italy. Thanks. I hope to repeat the experience next time we return to Italy. What’s neat is that no two experiences are the same! Irene, just send over the chocolate cake, please! Yum! Cooking in Italy is on my ‘to do’ list. Cooking classes ‘on the road’ are so much fun. You reminded me of how much I adore Italian and Mediterranean dining. Home Food sounds like a very good way to go. Really enjoyed the post. Just posted the recipe for the chocolate cake, in case you are interested! These types of cooking/travel experiences are priceless, aren’t they? You’ve got my mouth watering and my heart yearning for a return to Italy. Looks like you two did a great job, too. Your pic of the tagliatelle has made me particularly hungry. I just had some at a restaurant in San Francisco that was the best I’ve had since Italy. I loved meeting you and hope our paths cross again! The Home Food program sounds great! I would love to have a cooking lesson like this in Bologna. We recently had a home-cooked meal experience in Athens. While we didn’t get to cook, it was still a highlight to be in a resident’s home eating a meal together. What a wonderful program. Such a fun way to learn more about Italian food and cooking. You are so right, Donna. It also offered us another glimpse into Italian culture! What an exceptional experience, I would have loved to do that while visiting Bologna. Gives me another excuse to see that magnificent city. What a nice trip to look forward to at a very nice time of year! What fun. I’d much rather be part of a home cooking class than in a big auditorium styled classroom. Wonderful that Home Cooking is promoting this trend. It turned out that we were the only two in our class but the groups are purposely kept quite small. So interesting that restaurants in Bologna hire sfogline (pasta ladies) to make hand-rolled pasta for them each day! Fresh pasta noodles do taste so much better than what comes out of the grocery store box. Irene, what a great experience! So nice to be in a real home for an authentic experience! Your writing brings it all to life as always, and I must compliment Jerry’s pictures which are stunning and have me drooling! Do you have the recipes? I would love to try making the cake! Just posted the cake recipe, Laura! Thanks for your kind words. I did this when I was in Bologna a couple of years ago on a press trip, but I couldn’t pry any information out of them on how ordinary tourists could participate. I’m glad they’ve figured out how to share Home Food with the world! I learned about the organization from a friend and didn’t have any problem finding them on the Internet. I guess they have gotten better at promoting themselves. Nothing like home cooking in Italy! We have been lucky enough to experience it a few times, never organized like this, but great none the less. I love the idea of the “pasta ladies” arriving at the restaurants each morning to make their specialties ( I picture them with their rolling pins in hand!) We’ve long since wanted to take some traditional cooking classes and Home Food sounds like a fun resource to check out when we visit Italy. And wow, does the food look tasty! Hope you have the opportunity, Anita! What an interesting cooking program! And you learned so many interesting things in addition, most especially belly button pasta–who knew? I am tempted to try the chocolate cake and glad to see you’ve included the recipe. I always enjoy reading about your adventures!! What a great experience and all the food looks fantastic! Thanks for the great info. I took a pasta lesson in a little village with Wilma. It was so much fun! I will pass this on to the travel agents I work with! Loved reading about your experience, too, Penny! What fun Irene! I’ve often heard about Cesarine, but hadn’t read a detailed account of actually participating. So are you regularly making pasta at home now?! First, I want to master the Tenerina cake! What a great way to learn about another country and their culture-through the kitchen. I hope you’ve transferred all those great pasta making skills to entertaining at home! My daughter brought home her skills from Italy and regularly makes pasta for us. What a treat it is!